Setting up custom robot really helps In making your blog visible to search engines and also improve your organic traffic too. Remember that google helps you to get more visitors to you blog or website and it is the best search engine presently and the are based on keywords and other things like backlinks and many more. Having a good template is very important in times of seo. Must times you find it difficult to submit your site to google webmaster tools this is because you have not yet setup your custom robot. Below are some helpful tips on how to setup custom robot on your Blogger Blog. Go to your blogger dashboard and then click on that blog you want to work on. Now look at the top you will find description just type in what your blog is all about make sure it is short and meaningful because search engine like short topics. Now change www.skilztools.com to your blog URL. and then click save. If you want to check files on your blog use this type of example below. When you check it you will see the whole robot.txt code. Thanks everyone for reading this tutorial don't forget to drop your comment below thanks. That means the links having keywordsearch just after the domain name will be ignored. See below example which is a link of label page named SEO. Here yyyy andmm refers to the publishing year and month of the post respectively. For example if we have published a post in year 2013 in month of March then we have to use below format. 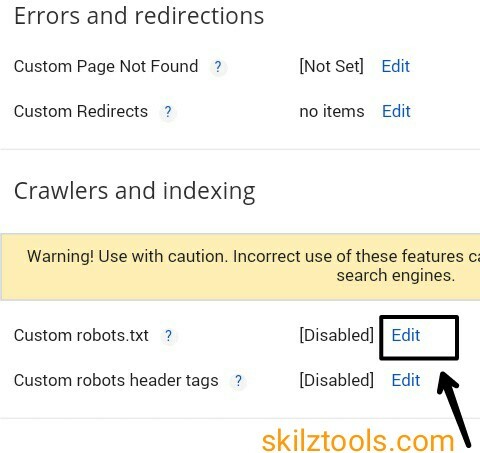 Change Skilztools.com to your website URL.